BEIJING - Some may think a nursing home is the only choice for a healthy and prolonged retirement life. Not so for 103-year-old Chi Guifang, who has spent half a century under the care of her son. 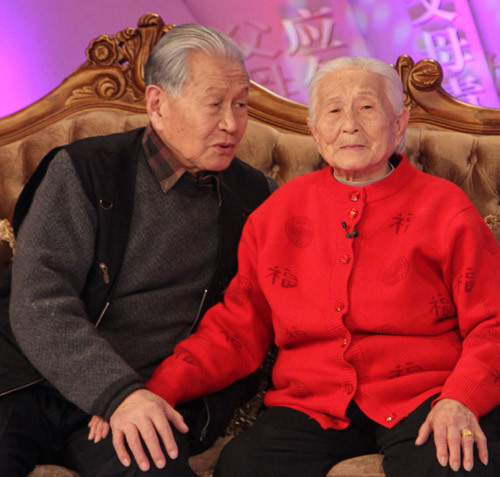 "When I was a child my mother took care of me, so it is my responsibility to help her when she is old," said her son Wang Tianxiang, who is now 82 years old. Wang is the eldest of Chi's three sons and two daughters. After her husband died when she was only 35, Chi raised all five children on her own in a seaside village in East China's Shandong province. Wang considered it his responsibility to take care of her after he graduated from college and became a scientific researcher at an institution under the China State Shipbuilding Corporation in Beijing. In 1964, he brought his mother to Beijing to live with him. Chi was then 56 years old. Like many Chinese women her age, Chi has bound small feet and doesn't like to walk. But Wang has managed to persuade her to walk a little every day with him. He even convinced her to follow his daily health routine, like rubbing his body with cold water every morning. "It was a habit for me growing up by the sea and I found it very helpful to keep me fit," said Wang, adding that he seldom gets sick and can do 40 push-ups at one time, which he demonstrated on the spot. Believing that his lifestyle brings good health, Wang also requests his mother stick to the same daily routine. At times, though, she chafes at his rules. "Sometimes my mother refuses to follow my healthy methods," Wang said. For example, in the evening, Wang requires his mother go to bed before 10 pm, which she complains about from time to time. "Sometimes I'm not sleepy at all so I refuse. But he will pick me up from the chair and put me on my bed," Chi complained. But Wang said he would tell her:"I listened to you when I was a child because you knew more than me. Now I am more knowledgeable about staying healthy, so it's my turn to decide for you." At times, he even lies down beside his mother, rubbing her back so she can fall to sleep easily - like Chi used to do when he was a child. Chi was illiterate until Wang forced her to learn to read when she moved to Beijing. Now she is basically able to read, and enjoys historical stories and classical novels. "People tend to become nostalgically sad when they are growing old. Especially my mother, all the things she thought of were bitter memories," Wang said. "I thought if she could read some novels and concentrate on the fate of people in the stories, it would be good both for her keeping a clear mind and maintaining good vision. "To help her live longer is also my responsibility." Beijing Television Life Channel contributed to this story.